Sails and rigging ready to cruise. 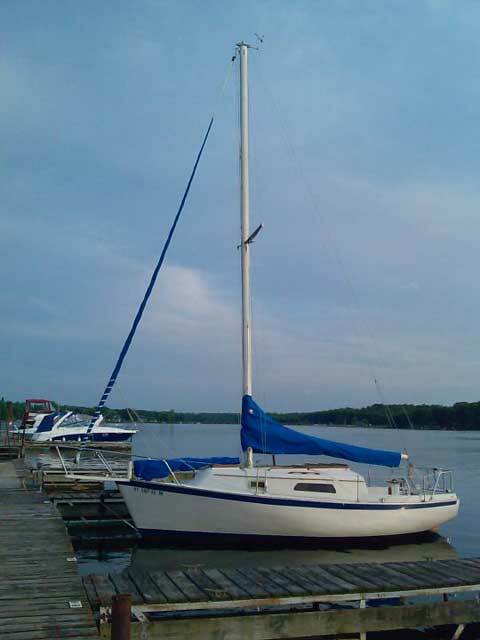 Fresh water boat located in upstate New York - easy access to barge canal and great lakes means it can be floated just about anywhere connected. The Irwin 10/4 was designed to provide solid, stable, roomy sailing fun for the whole family - and due to the size, lots of friends as well. Very large and comfortable 25 footer. Built with a solid fiberglass hull - no core worries in the hull. The ten foot four inch wide beam and 7000 pound displacement means a very stable ride, huge cockpit, and plenty of cabin room. Lots of teak, very classy feel below. 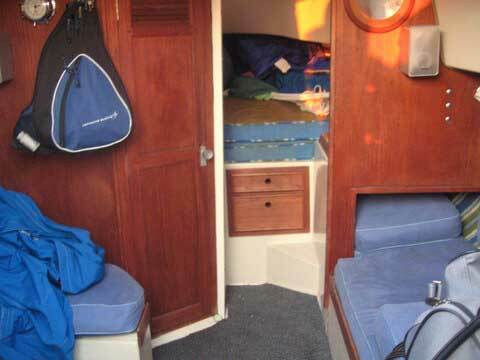 Near six foot headroom, six-foot-six v berth, bunks for five. Sail inventory: Mainsail, Genoa for the Harken roller furling. 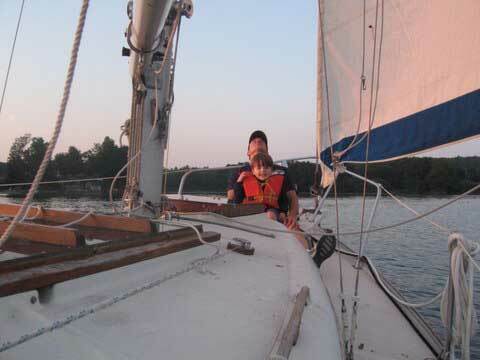 Staysail. Extra jib. All fine for cruising. 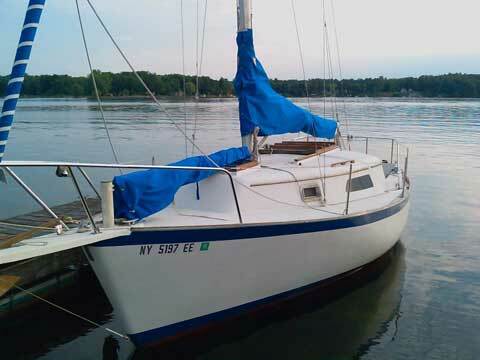 Bright Blue Sail covers for the staysail (good condition) and mainsail (fair condition.) same canvas for both hatch covers. Tall mast and a bowsprit for lots of sail area. Cutter rig with self-tending staysail. Mainsheet and staysail sheet led to aft of cockpit - if you don't unfurl the genoa you can trim and helm from the last two feet of the cockpit; great for having guests on board. Double reef points in the mainsail and Harken roller furling to shorten sail easily. Standing rigging in good condition, mast is down this winter and all was inspected. Reliable Yanmar diesel inboard - well taken care of; proper oil changes, Racor filtration (set up with 2 micron) and water separator, fuel lube, biocide, the works. Was setup by a marine diesel mechanic 2010, new fuel pump 2010. Strong alternator to charge dual battery bank. 20 gallon diesel tank. Spares. Softcopy of Manual. Two anchors; CQR(Plow)anchor (great for sylvan beach sand!) in bowsprit roller above anchor rode locker. Danforth backup. Icebox-very large-accessible from cockpit and cabin. Many spares, extras, and lagniappe. Worn centerboard pivot bearing reglassed, redrilled true and remounted with new packing 2012 New Raymarine depth sounder/knotmeter 2010. Wheel steering - fiberglass repair of broken pedestal 2010, rebuilt wheel mount(new brass key, lube) 2011. For serious inquiries, I have the report available from when I had a marine survey done three years ago - and can discuss how the priority needs have been addressed since then. Needs - no showstoppers. May change as weather permits work on it this late winter. Several small leaks into the cabin patched - need to make sure I got them before victory can be claimed. One interior cushion missing (at the moment, needs new foam. 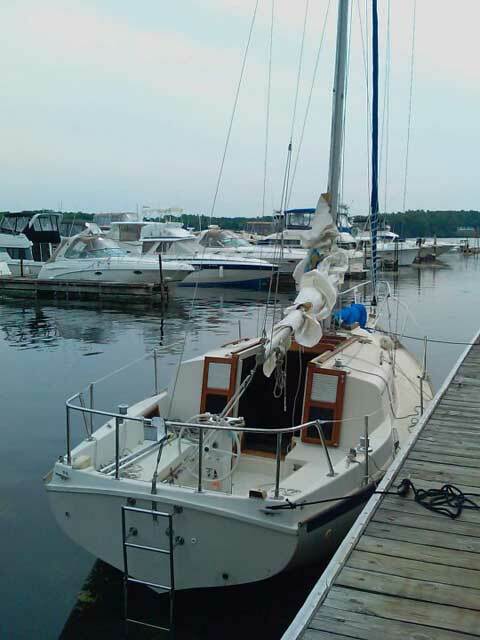 See "small cabin leaks" above...) New electrical connector at mast step needs attached and hooked up Needs anchor light if you want to anchor out overnight. 110v power system present. Have not used; understood from the previous owner that it worked nicely. Refrigeration system in the icebox, powered from the shore power. Have not used. Asking $6800, but given the wide values seen on these, is negotiable. Is priced well below the assessed value of $10,900 for an Irwin 10/4 in "Average" condition, due to Needs section above.